Jewelry dealer based in Shawnee Mission, KS has lost her lease. She decided it is time to hang up her spikes and quit running around the base path, as retirement looms near. She plans to auction off most of the merchandise that remained in her retail location at the time of closing. Dealer attests that all gemstones are genuine and the settings are in either gold or silver. All women's rings are size 7; men's rings are size 11; size does differ slightly due to the setting design. No ring size adjustments are being offered in this auction. However, most jewelers can perform this service for a fee. All Necklaces have a minimum of 18" length. Bracelets comfortable fit average women's wrist. All Lots come with new jewelry case. 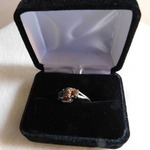 The auction service offers a shipping program via UPS (see terms), or you may have the jewelry dealer ship your items which have been carefully wrapped and cradled in the protective show containers featured with the item. The cost of this service is $25 per item purchased plus any insurance charge assessed by the U. S. Postal Service. If you feel having EstateSales-Bid perform the shipping, rather than contracting through United Parcel Service, or you missed their cutoff deadline, you may request this auction shipment arrangement at the conclusion of the auction upon payment for the item, making a shipment prepayment arrangement prior to shipping, by calling Larry Dean at 913-909-3749 the day of the auction loadout. We do not ship to a P.O. Box. Santa Ana Madeira Citrine Ring 1.5 Ct.
All women's ring sizes are 7. Buyer is responsible for any size adjustments. Typically a jeweler will decrease the size at minimum or no cost, as they keep the gold or silver extracted. To increase the size of the ring the jeweler will charge a fee. 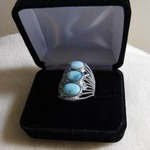 Every ring will be shipped in a new jewelry box, similar to the one shown. See shipping terms if not picking up in the Kansas City metro area. Mercury Mystic Topaz Ring 1.5 Ct.
Mercury Mystic Topaz/Rhodolite Garnet Platinum over Silver Size 7 1.5 Ct.
All women's ring sizes are 7. Buyer is responsible for any size adjustments. Typically a jeweler will decrease the size at minimum or no cost, as they keep the gold or silver extracted. To increase the size of the ring the jeweler will charge a fee. Seller does not offer resizing. Madagascar Apatite Ring 1.75 ct.
Madagascar Apatite Platinum Over Silver 1.75 ct.
PrasioLite (green Amethyst) 2.5 ct.
Santa Ana Madeira Citrine 1.5 Ct.
Multi color Gem Stones 2.5 ct.
All men's ring sizes are 11. Buyer is responsible for any size adjustments. Typically a jeweler will decrease the size at minimum or no cost, as they keep the gold or silver extracted. To increase the size of the ring the jeweler will charge a fee. Seller does not offer resizing. Men's 1 ct. Champagne Diamond 1 ct.
Men's Russian Diopside/Diamond 1 ct.
All necklaces come with the chain shown, which is typically 18". Buyer is responsible for any size adjustments. Typically a jeweler will decrease the size at minimum or no cost, as they keep the gold or silver extracted. To increase the size of the necklace the jeweler will charge a fee. Seller does not offer resizing, but does guarantee a minimum of 18 inches. Every necklace will be shipped in a new jewelry box, similar to the one shown. See shipping terms if not picking up in the Kansas City metro area. Sun Fire Quartz 9 ct.
Iolite (water sapphire) 3 ct.
Due to security reasons, unless you have made arrangements to preview items with Larry Dean at 913-909-3749, the location of the item pickup will only be revealed to the high bidders. Location of the pickup is in Overland Park, KS Zip Code is 66223. In the event you are having a jeweler inspect the items on your behalf your appraiser MUST attend the scheduled preview event. EQUIP-BID Online, Inc. (EQUIP-BID) is responsible for maintaining the EQUIP-BID.com website. EQUIP-BID.com serves as the venue used by Estate Sales-Bid and other independent auction companies (Affiliates) to present their online auctions to bidders. Beginning with auctions ending March 1, 2010 and henceforth, a fifteen percent (15%) buyers premium will be added to each purchase. Example: If you bid $100.00, at checkout you will be charged $115.00 plus sales tax based on the location of the auction. If tax exempt, contact Equip-Bid Auctions to provide the tax exempt form, and present it at the time you load out your items. Estate Sales-Bid is not responsible for maintaining your tax exempt paperwork, so this exemption must be presented prior to payment on your items. Invoice must be paid prior to removal of items. Payment will be accepted at time and place of removal. If removal is at any other location, payment must be made prior to, and a *Paid in Full* invoice must be presented when picking up. Regardless of pick-up location, all payment arrangements must be made within 2 business days of the auction's closing. Business days for Estate Sales-Bid are Monday-Friday. If invoice payment arrangements are not made by the end of each auction loadout designated time period, you hereby authorize your credit card on file to be charged for the total amount plus a $5.00 late payment fee per Lot. No late fees will be removed from an invoice once they are added. It is your responsibility as the buyer if you have not received a paid invoice via email within 24 hours of submitting payment to contact Estate Sales-Bid, or alternatively Equip-Bid to verify receipt of payment in order to avoid being charged a late fee. Accepted forms of payment include cash, certified check, money order, Visa, MasterCard, American Express and Discover. A valid credit card must be kept on file with Equip-Bid at all times. Equip-Bid has the right to submit an authorization from time to time to ensure the credit card is valid. If the card becomes invalid, Equip-Bid will disable your bidding rights and they will not be reinstated until a valid credit card is provided. Once an auction has ended, the items become the property of the winning bidder (buyer). The high bidder will be charged for their items using the credit card on file with Equip-Bid as of the closing of the designated pick up date, and any funds paid shall be forfeited to satisfy terms of sale. Buyer assumes all risk of loss and damage to property from that point forward including at the premises of the sale. The removal date and time will be posted on the terms for each individual auction. REMOVAL TIMES ARE ABSOLUTE. IF YOU CANNOT REMOVE YOUR ITEMS DURING SCHEDULED PICK-UP TIMES, DO NOT BID or Always MAKE ALTERNATIVE PICK UP ARRANGEMENTS PRIOR TO BIDDING! Failure to remove purchased items during time allotted pick-up time, EVEN IF YOU HAVE MADE PRIOR LOAD OUT ARRANGEMENTS, will result in a transfer and storage fee of $5.00 per lot. Ownership of item will then revert to party with primary vested interest in the item to sell or dispose of item as it sees fit. The buyer agrees to pay all deficiencies, legal, collection and other fees including transportation and storage expenses associated with delinquent accounts or abandoned/forfeited items. Premiums and fees remain applicable. Auctions at www.equip-bid.com will close at a rate of three (3) items per minute. If a bid is made within the last 3 minutes, the closing time for that item will be extended for five (5) minutes in order to imitate a live auction as closely as possible. If you have been outbid you will be notified by email ONLY until the day before the auction ends. The email outbid notifications will not be sent for an auction beginning at midnight (EST) on the day of the auction ending. To quickly review your bids and see if you are the winning bidder, you can utilize the Review Bids feature. Items which you have been outbid on will be marked. Notification of items won will be sent to you ONLY by email. It is the buyer's responsibility to check your email (it may be necessary to check junk/spam email folder.) If you feel you have won an item and have not received an email, you must notify Estate Sales-Bid or Equip-Bid by email or phone no later than 10:00 a.m. the day following the auction ending. In the event an item is not available for pick-up, the buyer must notify our onsite staff and file a claim within 24 hours of the pick-up date by replying to your original emailed invoice noting which items were not available for pick-up. After 24 hours past pick-up, Estate Sales-Bid, Equip-Bid and the buyer agree that no adjustments or refunds will be made. For demonstration purposes, various pieces of equipment or merchandise may be joined together. Do not assume a lot consists of more than one item simply because they are connected together. You are bidding on the item as it is described and not necessarily for all the items featured in the photo. Estate Sales-Bid and Equip-Bid makes an effort to ensure the descriptions are accurate and the photos match as well. However, an error can occur in the listing and in that case it will be the description and not the photo that will be the item won. If you feel there is a discrepancy or error between a listing and a photo, contact Estate Sales-Bid or Equip-Bid for clarification and notification of error. All items are sold AS IS, WHERE IS, with NO WARRANTY expressed or implied by the lot number affixed to the item. This sale is to the business community as home furnishings, furniture, equipment and inventory without any implied or expressed warranty. Descriptions are believed to be accurate but not guaranteed. When not certain of the condition or use of an item, please utilize any posted review date time permitted prior to the conclusion of the sale, and bid accordingly. We want everyone to get a good deal, and most will. However, when you bid on the wrong item or decide an item is not suited for your intended use, our clients are not willing to assume the cost of your mistake. Once bidding ends, the item is contractually sold to the highest bidder and that item is the buyers property. When in doubt about condition, completeness or suitability for intended use, please bid accordingly. Estate Sales-Bid reserves the right to add or remove items from an auction, split or combine lots, add minimum bids or reserve prices, cancel, suspend, extend or reschedule an item and/or auction event, and make changes to the auction closing, inspection, or removal times. Any controversy or claim arising out of or relating to this contract and/or agreement, or breach thereof, shall be settled by arbitration in accordance with the Commercial Arbitration Rules of the American Arbitration Association, and judgments upon the award rendered by the arbitrator(s) may be entered in any court having jurisdiction thereof. Estate Sales-Bid, Equip-Bid and Sellers liability shall be limited to the refund of bidders purchase price. The above-stated Terms and Conditions for Estate Sales-Bid and Equip-Bid Auctions cannot be altered except in writing by Estate Sales-Bid and Equip-Bid. If you want a quote before purchasing, click the online quote button below at least 48 hours BEFORE sale ends. Pay for item immediately following the sale, then email your invoice to ups2923@gmail.com asap so they can pick up your items on time. If you don't need a quote, you can just email the invoice immediately following the sale, however, you are 100% responsible for all shipping fees assigned. UPS will come pick up the items for you, professionally package, and ship to you. All pickups fees are waived when using The UPS Store's shipping services. All shipping transactions must be completed within 5 business days of pickup or items will be forfeited.